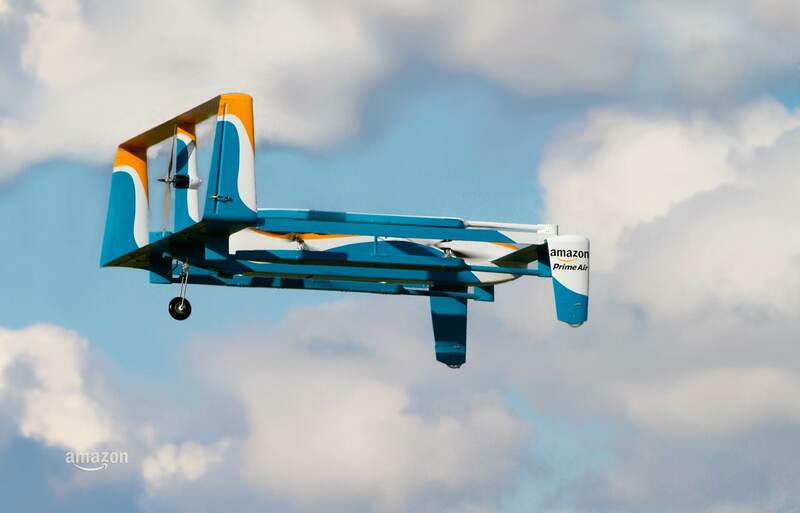 The Amazon Prime Air hybrid drone that was previewed on Sunday. Credit: Amazon. Via: Gizmag. In a video released on Sunday, Amazon previewed its delivery drone prototype. The two-minute teaser features a drone that can take-off like a helicopter and fly like a fixed-wing airplane, giving it greater range and the ability to potentially land right on your doorstep. While the Internet giant’s Prime Air concept has inched a bit closer to becoming a reality, the drone industry is not waiting for Amazon’s proposed special air zones before expanding on its own. There’s a burgeoning market for unmanned aircraft and, although the exact numbers vary, hundreds of thousands of drones are expected to be sold to eager shoppers this holiday season. In addition to the consumer and commercial demand, the market for military drones is likewise growing as the U.S. loosens controls on exports of UAVs. Canadian drone manufacturer Aeryon Labs received $60 million investment from American venture capital firm Summit Partners. Aeryon’s drones are popular among utility companies. The company will use the funding to double the size of its staff and expand its operations. “In the last four years, we have grown 100 per cent year-over-year in terms of sales,” Dave Kroetsch, Aeryon’s chief executive, told The Globe and Mail. Several large purchases of unmanned aircraft by foreign governments have been finalized in the past few months. Each of these deals has been several years in the making; together, they mark a significant increase in foreign military sales of U.S. drones over previous years. On October 6, the State Department approved the sale of four General Atomics MQ-9 Reapers and associated equipment to Spain for $243 million. On November 4, the State Department agreed to sell Italy a $129.6 million package of weapons required to weaponize its fleet of MQ-9 Reapers, making it the second U.S. ally after Great Britain to fly armed Reaper drones. On November 20, the U.S. finalized a $1.2 billion deal with Japan for three Northrop Grumman RQ-4 Global Hawk drones. Besides these big-ticket items, other smaller military drone contracts with foreign governments were announced this fall. In September, the U.S. agreed to sell small Boeing Insitu ScanEagle reconnaissance drones to the governments of Cameroon and Kenya for $9.4 and $9.9 million, respectively. The deal with Cameroon was accompanied by a promise to temporarily base a detachment of General Atomics MQ-1 Predator drones to aid in the fight against Boko Haram. Also in September, the U.S. sealed a $9.05 million contract with AeroVironment to provide RQ-11B Raven drones to Ukraine. This transfer was initially announced by the Obama administration in March. In October, AeroVironment announced that seven U.S. allies had purchased the RQ-11B Raven drone for a total of $18.5 million. The participating nations were not disclosed. The U.S. government announced on November 25 a $70 million contract with Boeing Insitu to provide the government of Afghanistan with 65 ScanEagle drones. It was also announced in November that General Atomics would provide contractor logistics support for French MQ-9 Reapers based in Niamey, Niger. This $19.07 million deal represents the third year in a row that American contractors will be working on the French Reapers in Niger. A variety of military contracts were announced for American drones spanning the procurement and modification of existing systems to research and development of new capabilities. Other items included $18.2 million for Logos Technologies for researching a wide-area surveillance system that can fit on a small drone like the Navy’s RQ-21 Blackjack. Cox Construction Co. received $26 million to build a new hangar and facilities for unmanned aircraft at Ft. Irwin National Training Center in California.